This tai poosam (2008) is going to have some changes in the festival schedule because this is the first tai poosam after a very long time, The code of conduct of jothi darshan drafted by Vallalar is going to be followed. 1.Special poojas from the day before for siva lingam. 2.Decorated Siva lingam brought outside for public presence around the Gnanasabai. 3.On third day siva lingam being taken to the sitthivalagam for reverent door opening. 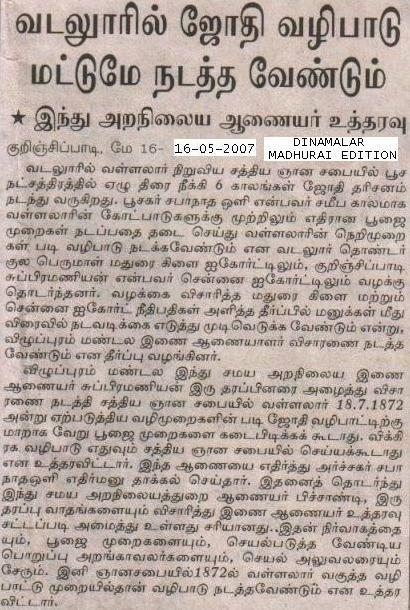 So this poosam is going to be different.Here is the news from Dinamalar published on May 2007 which describes the judgement on code of conduct for the Gnanasabai. Judgement synopsis:- Hereafter inside gnana sabai, the worship should be conducted as per the rules drafted by Vallalar in 1872.
vallalar avargal vurva valipatu muraiyai yetru kola villai.